Get fit at Pole Fit Dubai! Having a bachelorette party, birthday bash or just a girls night out? Make it an unforgettable experience by hosting a private party with us! Our amazing instructors will design a perfect session to make your event special for any occasion. 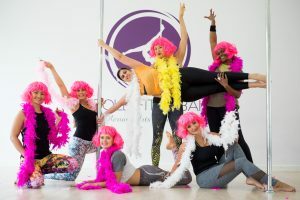 You will learn some sensual moves, spins, tricks and choreographed combos all in a fun and supportive environment, surrounded by your friends. Fun costumes, feather boas and other accessories are highly encouraged. You are welcome to bring banners, balloons, food or any decorations for the to set your occasion apart. Whether you’re looking for an afternoon activity or something to kick start your evening, pole dancing is a fantastic idea to have a great time and loads of fun with your friends. To perform best in this class, please advise your guests to wear shorts, bare feet, no jewellery and no moisturizer for at least 12 hours before the class.